The single most important factor for the Russian economy is the oil price. To maintain Russia’s expenditure before the crisis, I saw calculations that they needed a price around $117/barrel and their public budget is based on the more modest price of $100/barrel. 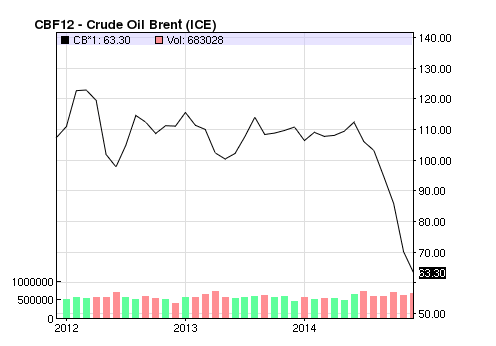 This morning, crude Brent dipped below $60 and the OPEC summit showed no signs of hindering this downfall. 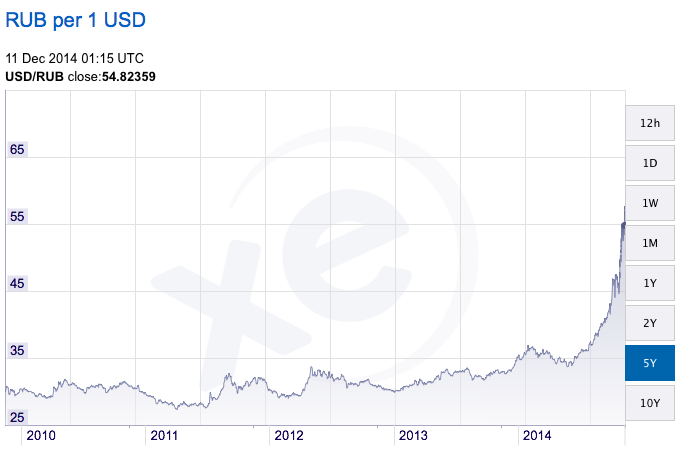 This can be compared to around $80/barrel when I wrote the last post six weeks ago. …drive up the Russian inflation, decreasing the buying power from the rouble, which in turn would drive up the prices in the stores. In this way, the inflation has increased almost by 1% the last six weeks and is in total up almost 3% since the beginning of the year. It further significantly decreases Russia’s and Russian banks’ ability to pay off foreign debt; something of which they have a lot. This decreases the functioning of the market. 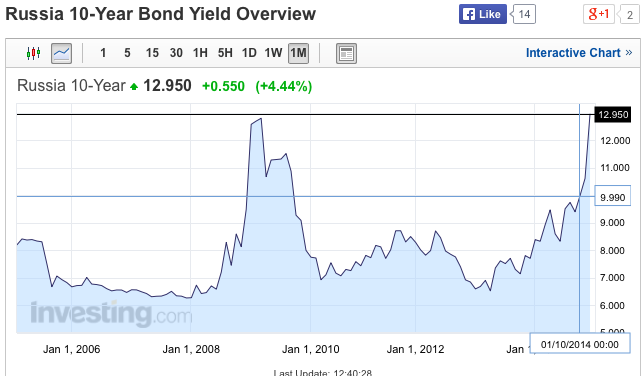 A good way to gauge the market perception of the Russian economy is to look at the yields for government bonds. These are, perhaps, pointing the darkest picture. At the moment of writing, the market has less confidence for Russia than under the economic crisis when the Russian GDP shrank significantly. Adding to this is the problems of capital flight and all the cash that the Russian government has spent in order to stabilise the rouble. What I argued in the last piece, of which I get support from Anders Åslund, is that an economy does not descend in a linear way. The current prognosis say that Russia’s wealth fund, currency and gold reserves will keep it liquid for a bit less than two years. That conclusion is only valid if you consider a worsening of the same rate as today. Since markets are to the largest extent about perception, the worsening would be exponential. If Russia runs out of cash, they loose the ability to control a whole range of factor that can spiral. This makes me want to flag for the opportunity of a economic crisis in Russia before that. Thus, the Russian economy comes out from the health check with all indicators pointing towards a worsening of the decease. What are the potential security political consequences of that? Well, I’d say the short answer would be, given that the increased funding for the armed forces, the quote “to a hammer, everything can appear as a nail” applies. And the armed forces are one of the very few hammers Rusai have. This entry was posted in Ryssland and tagged Ekonomi, Försvarsekonomi, Inrikespolitik by Oscar Jonsson. Bookmark the permalink. And the united states is doing great? 130 trillion dollars in debt. How much debt does Russia have? It’s really striking to what degree that Whataboutism is being practiced by the horde of Kremlin-sympathisers. In practically every commentary field for online articles taking a critical look at Russia one will find at least one commenter saying the equivalent of “Oh yeah, but what about the americans!?”. It’s a willful distraction from whatever topic is at hand, meant to remove focus from the actual critisism of Russia and the facts on the ground there, and instead turn the discussion into a simplistic fight between the blindest friends of Russia and the blindest friends of America. At the same time it reinforces the russian world view that the entirety of happenings in the world is being dictated from Washington and that only the conflict that the Kremlin purports to have with America is important. It has the added effect of shutting down the ability of commentary fields to provide insightful additions to articles, instead all thoughtful replies are being drowned out by the propagandists and the trolls, thus allowing those with the simplest messages to dominate and permitting blatant misinformation to stand virtually unopposed. Similar tactics are being used by neo fascist parties in the west, such as the Sweden Democrats, in order to stifle free and open debate on important topics and turn the discussion into a battle between the most gullible propagandists on both sides, with similar benefits for the enemies of democracy here too. And as usual no mention of the ‘russian’ central bank controlled by US puppets preventing any rouble investments by holding the interest well above all realistic profit margins. Russia is still in a colonial situation despite all talk of Putin being a dictator.. There is an atlanticist camp by some called the fifth column and apparently the two camps still coexist. The US is losing bad at the current oil price and China wins. The US is therefore in a hurry to achieve a new color revolution in Russia coming spring. But the russians know how that works. And the Chinese know it too. Gold price is suppressed to keep the dollar up. BRICS are buying gold. Bartering and gold-backed trade is ongoing. Time is running out for the dollar hegemony. Oscar, your vies are interesting but I really think you should do something about your English grammar, spelling and vocabulary. Their quality is frequently so unsatisfactory that it reflects negatively upon your post as a whole. Point taken, I wrote this one in a way to stressed position. The Ruble is now in free fall, and the Bank of Russia can not do much expect waste more of their inflated foreign reserve. Expect the return of the conventional unit https://twitter.com/search?f=realtime&q=%D1%83%D1%81%D0%BB%D0%BE%D0%B2%D0%BD%D0%B0%D1%8F%20%D0%B5%D0%B4%D0%B8%D0%BD%D0%B8%D1%86%D0%B0&src=typd in daily business before the end of this month.